Saturday (because I didn’t get around to writing anything) held out the long awaited – by some: ‘The Office Party’ with Jess W as host and the mastermind behind the all day fest. 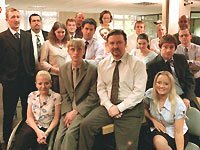 The Office is a BBC Comedy (The UK version I hear is the only one worth watching). Which if you are entirely interested, can find more about here. So a 12pm start dragged all the way through to 11:30ish. I say dragged, but it was quite fun – although I don’t really want to see any more of the show for a good few years. Two whole seasons worth and two longer Christmas Specials. The aim of the day, despite being social (yits and young adults and other crew there) was to raise money for TEAR Australia. I’m not sure how much was made in the end, but a goodly amount. There was a lot of food – including some rather good brownies, if I can say so myself, that I made to prove a point. Good thing they did turn out – saved my face. It’s a sorry thing when you get a reputation for not being able to cook when you’ve make a few mistakes in the past. We also played some game to do with TEAR stuff. Jessmyn and I had a miserable run of it. Dad used to run a slightly similar game (in principle) when we did the ‘missionary’ travel around and visit churches thing. Ugh. It was quite a brilliant day, if only for all the people there. Jess did a marvellous job hosting it all.